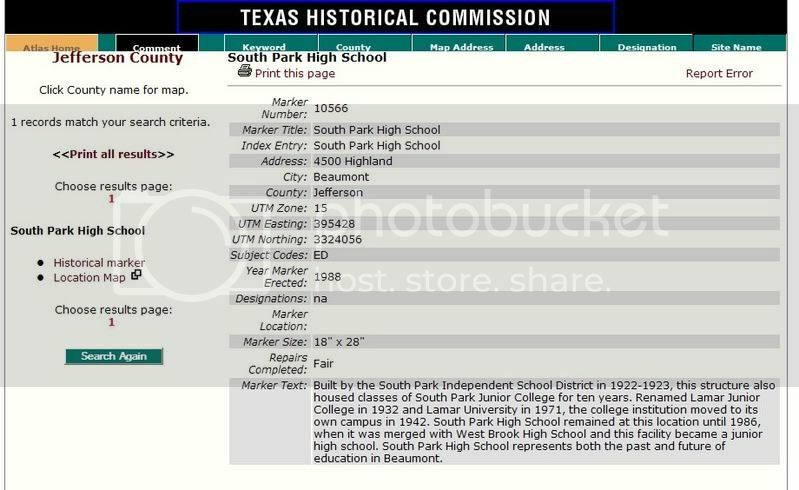 This site is a tribute to our beloved South Park High School, and the community in which it resided, South Park Neighborhood, in Beaumont, Texas. To tell the story to an outsider would be quite difficult as it involves at least as much intangible as it does tangible. The community of South Park was nurturing, safe, and a truly wonderful place to live, a place where the village indeed raised the child. To say it was right out of a Norman Rockwell would not be that much of an exaggeration. As we have learned through this tragic course of events, there is an uncanny brotherhood, camaraderie of all generations who grew up in South Park and/or attended South Park schools. The demise of South Park had been a long, ongoing process, which probably we should have seen coming, but yet were in utter disbelief when it confronted us. Perhaps my interpretations are a bit biased, but I believe the facts presented in the documentation contained herein will bear them out. South Park had its own independent school district in the city of Beaumont. There was also another school district that was comprised of the north end of town called Beaumont ISD. Needless to say, they were rivals, but it was a friendly rivalry at football games and competitions - SPHS the "Greenies" and Beaumont High School the "Royal Purples." SPISD was funded through tax base of the refineries and industry that was on the south side of the city; BISD had the more affluent residents but had virtually no industry as a tax base. SPISD was also better handlers of their funds. Demographics of the city began to change, and BISD was losing the residents who were moving to the new and growing west and northwest ends of the city - which were also within the SPISD district. Eventually BISD became bankrupt and requested SPISD to take them in. SP strongly did not wish to do this as we were taking care of our own while BISD had proven to be poor managers. Well, BISD found a way to force SPISD to take them in. They declared themselves insolvent, and, thus, by law then, SPISD had no choice. The merger was done. SPISD had no say in the matter. Soon following, former BISD members had enough clout on the school board and voted to change the name from SPISD back to BISD, they said since it "represented the city." Guess it's no secret that created quite a riff between the districts that never healed. By 1986, BISD demoted our once grand 4A high school that had won all kinds of sports and music and academic awards to a middle school. To further promote their distain for our school they deliberately avoided normal and routine maintenance to the building. That was attested to us by some of the maintenance crew. 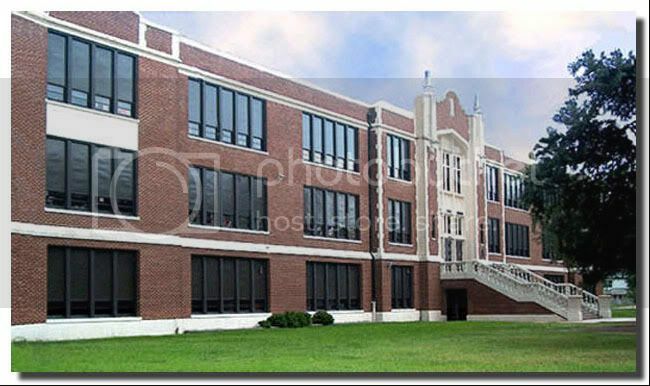 Finally, in 2007, BISD announces that they wanted to pass an enormous Bond Issue in order to rebuild several schools in town - (as well as a huge athletic complex that would come to be named after the BISD superintendent). But they promised over and over, they would not tear our building down. It would be preserved -- at least as much as possible. But we knew the history. We knew their desire to demolish it. 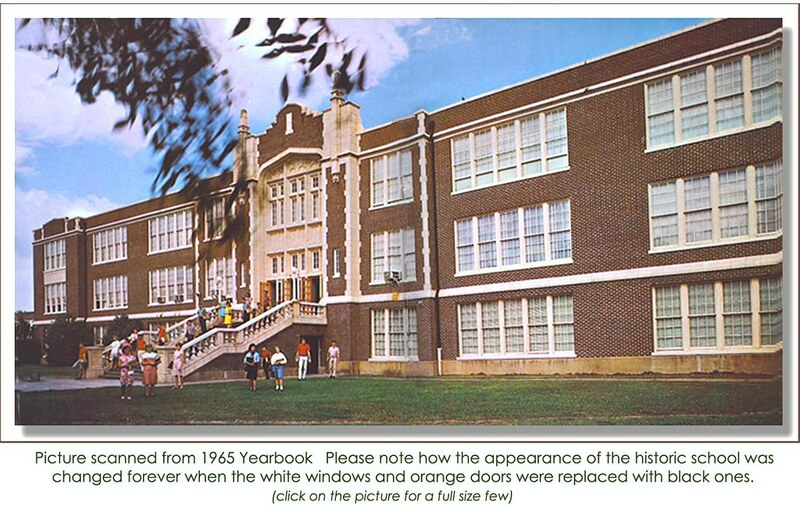 They had already demolished our historic Pietzsch Elementary school, and parts of our MacArthur middle school, merging it into one ugly, sprawling prefab building. And we also knew the distain that BISD held for us for a very long time. As a historical building, we did have a State historical marker, but it wasn't enough to save the building. Greenies from everywhere came to the defense of our school, Greenies from all classes from the past. We organized as best we could and embarked on a strenuous and bitter fight, having petition drives at which we collected over 3,000 petitions, meetings, media appearances, letters to the editor and officials, everything we could do to prevent the destruction. Commentators and newspapers were commenting and publishing more and more about the struggle. Well, they got the votes, and the Bond passed. Immediately they started taking steps to demolish the school revealing that they never had any intention of "saving as much as possible." It was all lie and deception. And it was this lie and deception that allowed for a temporary injunction against them. The court proceedings actually ruled in our favor - up to a point -- with scathing language about the lies and misrepresentations of not destroying the school; but the final ruling was that BISD could not use Bond money to demolish the school. That ruling was going to be appealed, but no more than did the judge utter the ruling than on Good Friday, 2010, the BISD had their contractor take a front-end loader and begin destruction -- front center. One of the workers told us that was their instructions, to start front and center! Though the legal fights have continued even after the demolition of the school, albeit, rulings have been consistently favoring the Save South Park movement and against BISD, it is not the purpose of this site to document those further court fights. Rather this site is a record of our fierce fight to prevent the school from being destroyed, a scrapbook, if you will, of the letters to editors, the broadcasts of TV stations and clippings of newspaper and commentary articles, documents from the court proceedings, and pictures of these events. Thank you, Margaret Foster, and Preservation Magazine! were sold as keepsakes and for fundraising during the campaign to save the school from demolition. They are NO LONGER AVAILABLE FOR SALE. South Park Heritage Association “SPHA," a 501(iii)(c) entity. The sale price indicated on each item is no longer pertinent, and links to the order forms are no longer active. Contributions will help SPHA preserve the artifacts / memorabilia donated by graduates of South Park High School. These items can be viewed by appointment at the SPHA museum, 4390 Highland, Beaumont, Texas, 77705.
or Jackie G. Frusha (jfrusha@swbell.net). If you have any comments or further information to share, please contact me. The pages should all open in a new page (or tab depending on your settings); so to return to where you were, just close the page (tab). Should there be any link that doesn't seem to go where it apparently should, then please notify me.